The commonest feature reported in haunting cases is odd sounds. The majority are clicks or knocking sounds. Less commonly, people sometimes report footsteps, dragging sounds, breathing, whispering and a mixture of other noises. These sounds are attributed to a haunting when there is no one present in the location where they appear to come from. They are therefore taken to indicate the presence of a ghost or other paranormal entity. Most of these sound sources may be obvious but they are not always immediately recognisable at all times. When sounds come from a distance or through walls they may appear different, even unrecognisable. In particular, in many cases the higher frequency component will be missing or reduced altering its tone. It may also be difficult to tell where the sounds are coming from exactly (see locating sounds). Apparently paranormal sounds differ little, if at all, in acoustic character from normal building sounds. It is usually the circumstances in which the sound is heard that earns it the label of 'possibly paranormal'. This means there is no easy way to distinguish paranormal from normal sounds, even if they are recorded. Most people do not hear the minor sounds that buildings produce all the time. These sounds are more readily heard at night, when there is little other noise, and can appear unexpectedly loud and oddly unfamiliar. Our brains automatically block out everyday minor sounds from buildings, treating them as irrelevant background noise. We may only notice such noises if we deliberately try to hear them or move to an unfamiliar building (see New House Effect) or are convinced the place is haunted. If a witness becomes convinced that their house is haunted, they become sensitised to normal building sounds and start to regard them as part of the haunting phenomena. The same happens on ghost vigils where participants are expecting strange sounds and so listen carefully for them. If they are new to a particular haunted venue this effect may be enhanced by the New House Effect. In many cases witnesses are not able to tell where sounds originate. This is not surprising because in buildings sounds reflects off walls and diffracts round corners. So if a sound does not originate in the same room as the witness, it can be difficult to tell where it comes from. This is important because a sound may appear to originate in a room known to be unoccupied when, in fact, it does not. We can only accurately decide where a sound comes from if we have an unobstructed view of its origin point. This problems are illustrated in the figure, right. A sound is produced by a source (S) in one room and heard next door (L). Where does the sound from S appear to come from to listener L? 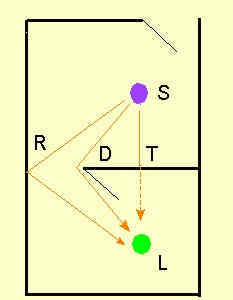 There is sound reflected from a wall (R), diffracted sound (which goes around the wall) through the doorway (D) and attenuated sound through the wall (T). Depending on the relative sound intensity from these three paths, the sound could appear to originate from any of a number of different locations, most of them wrong. Humans detect the direction of sound sources by two methods. At low frequencies (below about 1500 Hz) the phase difference in the sound waves is used. At higher frequencies (above about 4000 Hz) , the difference in sound intensities caused by the head acting as a sound shadow prevails. With a sensitivity ranging from 20 to 20000 Hz, it comes as no surprise that the reliability of this direction-finding system varies according to the frequency of the sound. In addition, faint sounds are difficult to locate because the sound differences across the head are too small to be detected by ear. Investigations of haunting cases show that many minor sounds originate within the fabric of the house itself or inside items in it, like furniture. During ghost vigils it is common to hear such sounds, particularly clicks and knocks. On the spot investigation usually reveals these to be natural sounds. They are mostly due to the release of physical stress within objects. 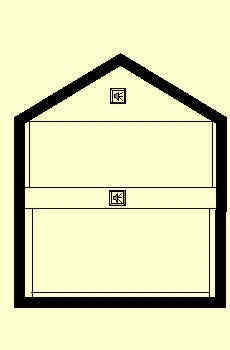 In the illustration, right, the main sound sources in the house are in the attic and in the gap between the top and bottom storey. These areas often contain joists which may produce clicking sounds when they expand and contract as the temperature varies during the day. Any building, and the objects in it, is regularly exposed to physical stress. The changing temperature during the day makes objects expand and contract slightly. Floorboards are stressed by people walking on them. Furniture is physically stressed by people sitting on it, lying on it or placing objects on it. None of these structures, whether the fabric of the building or furniture, is perfectly elastic. That means that when a load is placed on a chair, for instance, it will bend slightly. When the load is taken away, the chair returns to its original shape. Or at least it would if it was perfectly elastic. In real life, the chair will not quite return to its original shape. And this slight residual distortion, rarely visible, leaves a small amount of physical stress (unreleased physical forces built up in the fabric of the object) within the chair. This may be released over time, sometimes causing audible clicks or creaks. It is assumed by some witnesses to hauntings that such clicks may indicate the presence of a ghost or entity. In reality, ghosts are never seen knocking or hitting any object so there is no evidence that they are responsible for these noises (see what we know about ghosts). There are a tiny number of cases where clicks (or 'knocks') have shown apparent two-way communication. However, it can be easy to assign 'intelligence' to frequent, but randomly timed sounds. Without careful recording and statistical analysis it is not possible to demonstrate whether such sounds could represent any real communication with an unknown entity. It is almost impossible to predict when physical stress built up within a building's fabric, or the objects within it, will be released. Left alone, such stresses can be released at any time. However, when temperature changes are rapid, such as when central heating is switched on or off, this may precipitate a higher frequency of stress-release 'knocks' than usual. Also, touching furniture, even quite lightly, can precipitate the immediate release of stored physical stress. When someone is walking on floorboards it is common to hear clicks and knocks produced, as well as the more familiar creaks, as stress is built up and released. Because floorboards are physically connected to one another, the click may come from a part of the room some way off from where the person is walking. This may, naturally, give the impression of being unrelated to the person walking and so possibly paranormal. Wood, which is common in the fabric of buildings and in furniture, is an important source of stress release knocks. Other materials, also commonly found in buildings, can also build up internal stress however. Metal water pipes may 'click' when they are heated or cooled, from the passage of hot or cold water, for instance. The frequency of stress-release noises in buildings is governed mostly by temperature changes. It is also affected by how much people move around in a building and the use of machinery than causes vibration. If you put gentle hand pressure on a wooden piece of furniture you will often here a click or knock as stress is released. Further touches often bring no further reaction as the stress has gone. Knocks and clicks appear to be more frequent at night, primarily because it is quieter. However, this time may also be a peak because heating is turned off, cause a relatively steep decline in temperatures. This whole subject requires lots of research, plotting knocks against time and temperature, for instance. Knocks and clicks are the most commonly heard noises attributed to hauntings and poltergeists. Below are some examples of the kind of 'knocks' and clicks and that might be encountered in a haunted location (and a few that won't). The intensity of sounds typically produced in buildings (whether haunted or not) is illustrated graphically below. It varies a lot as the examples show. In the samples, the sounds were mainly induced experimentally in ways very similar, or identical, to those that occur naturally in buildings. It shows the sort of thing that can be expected in actual haunting cases. Important notes: All the samples below (click on each 'example' link to play the sound) are very short and correspond exactly with the accompanying graph. You might want to put your sound player on repeat to appreciate the noises. All recordings were made with the same digital sound recorder. The same time scales are used on each recording though some sounds are louder than others leading to different intensity scales*. None of the samples was recorded in a haunted building. The sound appears at its maximum intensity virtually immediately and then fades rapidly away. It is strongly dampened by the wood itself. Example 2: The next example is a heavy wooden piece of furniture has been deliberately pushed. Light hand pressure was used, nowhere near enough to move the furniture but sufficient to create or release physical stress within the object. This kind of sound can appear naturally through temperature changes during the day. In this graph you can see that the sound intensity does not rise so suddenly (see box) as with knocked wood and the reverberation takes much longer and does not fade rapidly. Though it sounds different to example 1, it is still recognisably a 'knock'. Example 3: This example is a different piece of wooden furniture being pushed by a hand. By doing this it is possible to produce knocking sounds similar to those heard in haunting cases. Though still an abrupt sound, it is less like a knock and the sound wave does not look anything like the deliberate knock (example 1). Example 4: This example is a very sharp 'rapping' sound. However, it was produced simply by someone walking up some wooden stairs. Rather than a creak, we hear a sudden 'knock'. Note how the waveform resembles someone knocking the wood (see example 1), but with a less steep initial rise in intensity. However, it came purely from the pressure of someone walking on stairs. Example 5: Here is another example of a click produced by someone walking up wooden stairs. Once again it is not the familiar creak often associated with stairs but two sharp clicks. Note how different the two waveforms are, despite sounding similar to each other. The waveform of the first click resembles someone hitting wood but the second does not. The second waveform is probably produced by two clicks coming very close together as can happen with strain release. Example 6: In this example, a door is closed and as this happens it lets out a single 'knock' noise. Doors often also creak on their hinges. The waveform here rises and falls at a similar rate, quite unlike a deliberate knock (example 1). However it still sounds like a deliberate knock. In the following pair of examples we compare two deliberate knocks on a wall. However, one is inside the room with the recorder and the other outside. Example 7a: Deliberate knock on the inside wall of a room containing the sound recorder. Example 7b: Compare this with another knock with the same room but this time the knock is on the outside wall and the room door is closed and recorder inside (ie. with a thickness of wall between them). Both graphs cover the same time period to make direct comparison easier (though sadly the sounds are not aligned). You will see that the sound intensity takes longer and rises more gradually for the knock made outside the room compared to the one inside (see box). The sound in 7a takes 0.0056s to reach peak while 7b takes 0.0063s, some 12% longer. This sort of effect can be expected in haunting cases with most building sounds originating from behind walls. If you play the two recordings, the second sounds lower in pitch than the first. This effect also arises when the recorder is distant from the sound origin or if there intervening objects, like furniture. Generally knocks heard in haunting cases will sound low pitch because the high frequency elements are missing. The higher frequencies are absorbed by solid objects and, to a lesser extent, by air. Example 8: This recording is not a simulation! It is genuine recording of a heat-induced building noise. Notice the gradual rise to peak sound intensity (compared to example 1) and the twin peaks. This is completely unlike the noise of an impact. It represents stress being released within the building structure. The material producing the sound in this case is probably wood (there were several materials present and it was difficult to isolate the particular one responsible). This is just the sort of noise that can be heard in quiet buildings at night as they cool down. Example 9a: This is a recording of a deliberate knock on a wall with the recorder very close (less than 1m). See how the sound reaches a sudden peak, within 0.0018s! Here is the frequency spectrum for 9a. The scale on the right shows frequency from 200 to 2000 Hz. It peaks up to around 1800 Hz. Example 9b: An identical knock (same surface, same place) but recorded from further away (around 3m). The impact point is still within direct line of sight. In this example the sound reaches a peak after 0.0081s, some 4.5 times longer than 9a! Here is the frequency spectrum for 9b. It peaks at around 1400 Hz. The highest frequencies are lost because they are absorbed by air preferentially compared to lower ones. Example 9c: Another identical knock to 9a and 9b but even further away (around 6m). There sound recorder is also round a wall corner from the source though still in the same room. In this example the sound also reaches a peak after 0.0180s, some 10 times longer than 9a and over twice as long as 9b. It means the bulk of the sound came over a path around 5.5m longer than the shortest route. Here is the frequency spectrum for 9b. It peaks at around 1200 Hz. Yet more high frequencies are lost. Some will have been lost because of the longer, reflected, route taken by most of the sound. Some may have also been absorbed by the wall by sound taking the most direct route. The reason 9b and 9c take so much longer to reach a peak is that a significant proportion of the sound reaches the recorder through being reflected from the surrounding room walls. Clearly these sound waves take longer to arrive than those arriving directly so the sound peak builds more slowly. These figures will vary depending on the size and shape of the room. What these samples show is that you can get a click or knocking sound from the fabric of a building, or objects inside it, without anything being physically hit or knocked. Further, though the noises all sound similar, they have a range of different wave patterns, several quite different to a deliberate knock. What they all have in common (apart from examples 1, 7a and 7b) is that they are caused by stress being induced or released within the structure of the object by applying or removing pressure. Though each example sounds tonally different, they might all be described broadly as 'knocks'. In one heavily investigated haunted location a reported sound of 'people whispering' was eventually discovered to be an intermittent flow of water in a pipe behind a wall! Apparent voices are more often recorded by sound recorders than actually heard by witnesses. The fact that such voices are recorded but NOT heard is often taken as a sign of paranormal origin though there are other possible explanations. Such EVP is dealt with elsewhere. The wind can produce strange sounds, including an 'moaning', as it blows around buildings. It can also induce stress release type clicks and knocks when there are sudden gusts. Scratching sounds are also sometimes heard, usually from wood. This is probably another example of physical stress being released. More research is needed into the various odd sounds heard in houses and their origins. When investigating haunting sounds, it is important to find their true origin. For reasons mentioned above, this can be difficult. However, if a sound repeats reasonably frequently it should be possible, by moving around from room to room, to determine where it is coming from. If the sound is coming from an object, like an item of furniture, it may be possible to induce the same sound by light hand pressure. You should try to record the sound and compare it with any induced version to see if they are similar. Many sounds recorded in haunted locations show a relatively slow build-up in intensity (see example 9 above). This occurs because the source of the sound is not in direct line of sight with the recorder (if it was it might be visible). Take the example in the diagram, right. Some of the sound waves from source S will reach the recorder L directly through the wall (route T). Others will be diffracted (route D) and some reflected (route R). The sound that travels through the wall will usually be strongly attenuated, as will that which has been diffracted. The most intense sound will (usually) arrive by direct reflection, provided the reflective surfaced is reasonably flat and smooth. Sounds going via D and R will take longer to arrive at L than those via T because they take a longer route. Hence the sound recorded at L will show a gradual build-up in intensity as first the weak T route sound arrives, followed by the stronger D and finally strongest R route. It is not always quite this simple as it depends on the reflective surfaces, sound absorption by the wall, width of the door, wavelength of the sound and so on. But, in general, you will always get a more gradual build-up in intensity when there are sizeable obstructions between S and L. There will also be a notable loss in higher frequencies in sounds because of the longer distances taken by routes D and R.
In example 9C, above, the delay amounted to a calculated extra path length of 5.5m for the most intense, reflected, portion of the sound. By using a scale diagram, it should be possible to plot likely reflection paths from the recorder and get a rough idea where the sound may have originated. For the example in the diagram, the only reflection route is through the doorway, making it relatively simple to plot where S might be. If you try knocking objects at the likely plotted location for S, you can compare recorded sound signatures, like those in diagrams 9A to 9C, to see if they match. See here for more info on sound reflection, diffraction and attenuation. In example 1 you can see the classic sound intensity profile of an impact between two objects, such as someone knocking a table with their knuckles. There is a sudden increase in sound intensity followed by a slightly less rapid fall off. The largest factor in slowing the rise to peak sound intensity is where a sound source is relatively distant from the recorder, compared to the size of the room, or there is an obstruction in the way. This is because part of the sound goes by a longer route, through reflection off walls for instance, than the rest (see investigating haunting sounds). There are other causes too, such as when there a solid object between the source of the sound and the recorder, and no possibility of reflection. When sound goes though a solid object it splits into two different modes (transverse and longitudinal), unlike in air. The two modes travel at different speeds, one roughly twice the speed of the other! Thus, part of the sound arrives on the far side of the solid object well before the rest. This results in the overall sound intensity taking longer to rise to a peak. In addition, high frequencies are lost because they are absorbed by the solid object (compare example 7a and 7b). The degree of these effects depends on the type of solid material and its thickness. The effect was small in example 7 because the 'wall' used was more like a thin partition! Most building sounds originate within walls or furniture so there will be at least one layer of solid material between them and any sound recorder. Thus, many building sounds, like example 8, will show this kind of sound profile. It should be noted that, if you were at the origin of a 'stress release' sound you would almost certainly see a typical percussive sound profile like example 1 (indeed some examples, not shown here, DO look exactly like that). It is only because the sound travels through solid material that the profile changes to a less steep initial rise in intensity.